Do you ever wonder what is the demographics of people who follow you on Twitter. How many of your Twitter friends are men? Or women? Or random colored eggs, people who are either too lazy to change their default avatar or maybe they are Twitter bots. The Graph Search of Facebook can provide deep insights into the demographics of people who are connected with you on the social network. For instance, you can write a natural language query like “My friends who are older than 30” or “My female friends who live in Delhi” and the answer will be available instantly. Such granular data is however not available for Twitter users. How do you programmatically determine the gender of a person on Twitter? The Twitter API doesn’t provide the gender information but there’s a workaround. You can take the profile picture of a Twitter user, feed it into Siftr’s Vision API and it will detect the gender of the most prominent face in the photograph. You can go a step further and use Microsoft’s Face API and it will even provide the approximate age of the subject in the photo. Meet Twitter Analyzer, a web app that analyzes your Twitter network (friends or followers) and logs the details of all user inside a Google Spreadsheet (see screenshot). You get to know their gender, how often they tweet, where are they located, when did they last join Twitter and more. Getting started is easy. Go to labnol.org/analyzer and sign-in with your Google Account. It requires all these permissions because the underlying Google Script saves everything inside a Google Spreadsheet that will be in your Google Drive. Once the Twitter followers have been analyzed, you’ll get an email notification. After you’ve granted the necessary permissions, click “Authorize Twitter” to allow the sheet to access your Twitter account. It will never post any tweet to your profile. Next click the scan button and close the page. You’ll get an email once the analysis is complete and this time will vary based on the number of followers you have. 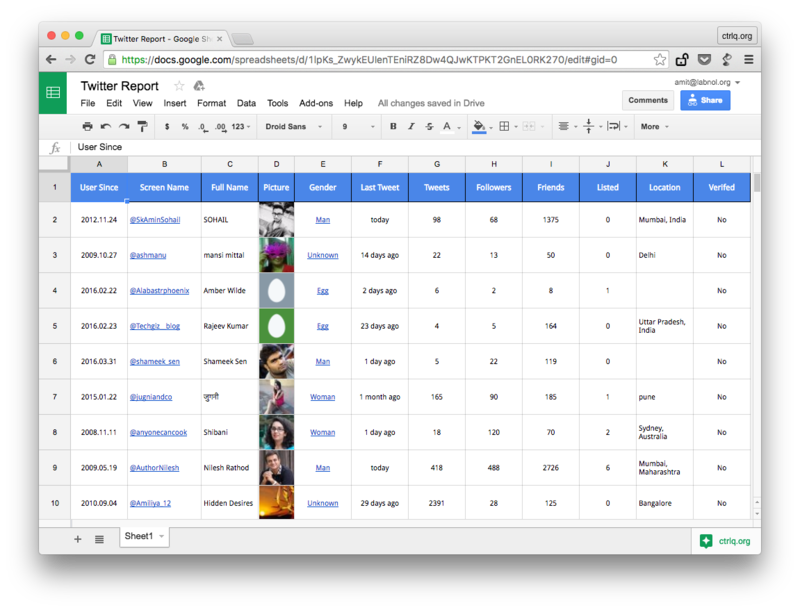 The Google Spreadsheet that is generated by the Twitter Analyzer app includes most of this information as well. Thus, apart from gender analysis, the Analyzer app may help you figure out how many fake bots and inactive profiles follow you on Twitter.